the teacher wife: Gold for Good Behavior! Oh man... when it comes to behavior my little sweeties have been struggling lately! I think spring fever has kicked in and all they want to do is go outside and play in the sunshine (too bad it is going to snow this weekend)... My old tricks haven't exactly been working, and so I had to come up with something new. 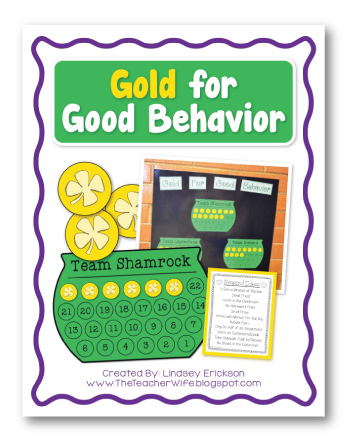 Since it is March, I created a behavior management packet called Gold for Good Behavior. I have been using this with my students for a few days now and it is working like a charm! I have divided my students into three teams: Team Shamrock, Team Leprechaun, and Team Ireland (these teams, and lots more, are available in the packet). Whenever I see a student with exceptional behavior, then they get to add a gold coin to their team's pot-of-gold. When a team fills up their pot-of-gold, then they get to have lunch in the classroom with me (lots of other reward suggestions are available in this packet, too)! I put everything on a black poster board and then laminated it. My students put the gold coins on with sticky tack (I sticky tack each coin ahead of time). The poster is in a place where everyone can see it. I am excited to use this behavior management system the entire month of March! What are some of your behavior management tricks?! The first three people who comment with their email addresses will get this packet FREE!